A number of courses around the world have attempted to attach the ‘links’ title simply because they are built near or on the coast. But very few have those qualities of delicate turf, sand, undulating fairways and hard greens that truly define traditional links golf courses. Estela Golf Club can rightfully boast to being one of the few that can justifiably lay claim to the ‘links’ title, although the lack of horizontal freezing rain and winds that chill to the bone will disappoint the purist! In fact, Estela is cooled by the omnipresent Atlantic breezes in the summer and warmed by the Gulf Stream in the winter, it’s therefore wonderful weather for year round golf. As with the Costa Brava in Northern Spain, this area of Portugal never experiences the searing summer temperatures of the southern resorts, but will stay pleasantly warm during the winter months. Situated on the stunning and at times dramatic Minho coast of northwestern Portugal, Estela is set 30 kilometres north of the beautiful city of Oporto and near the lively summer resort of Póvoa de Varzim. The course was designed by Duarte Sottomayor, who started his career working with the world renowned Robert Trent-Jones. Inaugurated in January 1989, Estela is a traditional par 72 layout measuring almost 6,300 metres from the back tees. The quality of the course was immediately recognised and, since it opened, Estela has played host to a number of amateur and professional events including the Portuguese Open in 1991. Sottomayor has developed the 3-kilometre strip of coastline on which Estela is sited into a wonderful test of golf. Wherever possible he has used the natural sand dunes and shoreline hazards to shape the holes and simply placed tees, elevated greens and fairways between the dunes to stunning effect. The addition of a number of well-placed lakes adds to the struggle a golfer will have in achieving a respectable score. Estela will require long straight drives to fairways almost totally bereft of fairway bunkers. A lack of bunkers does not make things easier for the player, because missing the narrow fairways will undoubtedly mean an excursion into the dunes and usually the sand and grass will prevent any thoughts of making the green in regulation. Open green fronts will allow the skilful ‘links’ golfer to play low, running approach shots to putting surfaces that are renowned for their subtle undulations and speed. Estela opens up with a couple of reasonably gentle holes, but apart from the short 8th the rest of the front nine will test the golfer to the limit. The 3rd is stroke index 1 and the 4th a cracking par three measuring 175 metres across a valley to a green bordered on the left by the beach. No let up through holes 6, 7, 8 and 9, as they are all long with tight fairways and well-protected greens. The back nine is arguably slightly easier with the pick of the holes being the par three 12th hole, the par five 13th, the short par four 16th and the final hole that plays significantly longer than its 359 metres suggest. The par five 13th is a classic ‘links’ hole, running alongside the beach before dog-legging and dropping downhill to the green. In 2013, as part of an on-going course improvement plan, the green on the long par five 7th hole was moved 45 metres to the right, enabling the old green site to be used as an elevated platform for tee shots across the irrigation reservoir on the following hole. Estela Golf Club is one of the best real links golf courses in Portugal. Located in front of the Atlantic Ocean, in an environmental protected area, with a breathtaking view, direct and exclusive access to the beach, ample spaces and good service. 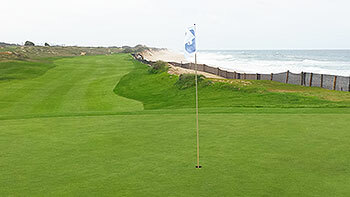 Par 72 championship golf course has three kilometers of Atlantic Ocean coastline as background. Clubhouse is huge and has a lot of space for proshop and dining area, restaurant on second floor with beautiful view, really tasty beer, wine and food. They have a good practice area with huge 400 m. driving range and large pitching green and chipping green. Mostly windy here and middle summer hot isn't feels at fields. Course is long, but playable without buggy. Exactly I prefer walk here and find it comfortable. I was played here twice in the middle of the summer and one time was very windy day with true challenge in all holes. Amazing views around from some of the greens with ocean and landscape. Fields condition was good, greens and fairways maintained. The prices are acceptable and they time by time have special offers for green fee plus club rent or lunch and etc. with very attractive prices. Fairways are wide enough for long drive and greens also large. Was played from white tees so holes is long enough and challenging (especially windy days as usual are here). Depends on wind direct some holes greens reachable only with third shot from tee. Funny, but wind can make you many surprize at first nine if it goes from ocean and great challenge to attack the pin correctly. When you’ll play into the prevailing north wind at holes 1st to 5th, shots from tee requires many efforts and accuracy, for example the 4th hole par 3 downhill is the beast when the wind blows hard. To choose correct club is big challange to reach a small, raised green. Forget birdie... :) I think par here is very very good result. On the back nine game stay bit easier and long hitters can try for birdie at 13th and 15th holes (par 5). The 13th hole allows huge long drive when wind blows to back and you can easy reach green with second shot. Don‘t relax at tricky 17th hole with usually front wind this par 3 is very deceptive and correct club is required to reach green (two or more lower than usual at this distance). Avoid slice shot - wind will blow your ball to hazard or out of bonds in the right (lost ball garanteed). Finally Estela Golf Club is the place where you can check your game level. It's really pleasant play here. Will be back. I played this course on a very windy day and it was a very tough test of golf. I play most of my golf on links courses in Ireland and I was delighted to find a pure links gem in Estela. The opening five holes are played right along the shore and are very tight and demanding. The 1st, 3rd and 5th are challenging par fours and the 4th is a great par three. 6th to the 9th play inland on the opening holes back to the clubhouse and are all good holes. The back nine starts with four holes along the shore again which are good holes that offer a little more room than the opening holes. The 15th is a strong par five which is very narrow near the green. There is a lovely mix of holes on this course with four par threes and four par fives. Excellent championship course along the seaside. Very demanding as fairways are narrows and holes not short ! Greens in perfect conditions ... Excellent clubhouse and services. By far the best course around Porto ! Will come back for sure ! Estela is beautifully situated next to a fine stretch of beach and the Atlantic Ocean. The course is pure links containing all of the ingredients that you would find on our more familiar courses in Britain and Ireland. The front nine is situated on the higher ground and therefore has the better views of the impressive beach and Atlantic Ocean. Fairway bunkering is minimal but you will need to find the narrow fairways as the sandy dunes will gobble up any wayward shots. The greens are a joy to putt on, many being small, raised and undulating which offer an interesting and challenging test for all. The course is beautifully designed and visually very appealing, many holes having raised tees which allow you to fire down the narrow valley fairways before having to hit up onto a raised green. The back nine is slightly more sheltered but the quality of the golf remains equally high. There are plenty of excellent holes that are worthy of a mention. The 195 yard 4th is a magnificent par three with a pretty green nestled on a dune. The 5th and 6th are strong par fours, both playing along natural valleys to raised greens. The 9th and 15th are both excellent and require a carry over water from the tee, the 15th becoming a strategic par five as it narrows considerably on the approach to the green. Very enjoyable course. 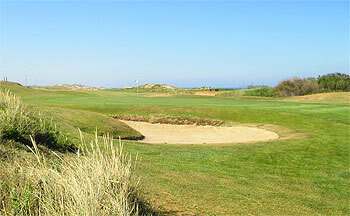 Many of the holes feel like genuine links holes and even those set away from the beach add interest. Well worth a visit. Testing in the wind. The course didn’t make the cut in George Peper and Malcolm Campbell’s “True Links” book, but don’t let its omission from that excellent publication fool you into thinking that this delightful track is anything other than a links course. Grasses may not be the correct strain for purists and several holes (8, 15 and 17) require lengthy tee shot carries across ponds so I can see how some golfers might prefer to describe Estela as more seaside than links. Considering the club has erected a fence along a 3 kilometre stretch of coastline to help keep the encroaching dunes at bay (failing miserably in the battle against nature along the entire left side of the 3rd and 5th holes, where mountains of sand have tumbled onto the fairways!) then you can understand why others might look upon Estela as being as near to a proper links as you’ll find in this part of continental Europe. Arranged in two returning loops of nine, you’ll play into the prevailing north wind at holes 1 to 5 then at holes 14, 15, 17 and 18 on the inward half. The slightly downhill par three 4th is the stand out hole on the card and it’s an absolute beast when the wind blows hard, as I found to my cost when a full-blooded drive off the tee was unable to reach a small, raised green nestled into the dunes. On the back nine, holes 11-17 lie on the other side of a road that cuts through the course and they’re accessed by a couple of wooden bridges that transport golfers up and over the traffic below. It’s on this stretch that you can afford to open your shoulders and try for birdie at the par five 13th and 15th holes. Estela has hosted the European Amateur Championships five times since 2000 so a relatively benign slope rating of 133 from the back markers belies a capability of testing the very best players on the continent, especially when that ever-present wind gets up.